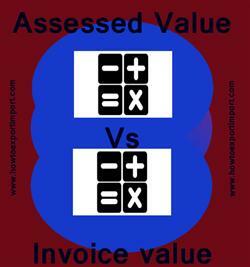 Now let us discuss about the difference between Assessable value and Invoice value. What is assessed value? How does it work in an Import export business? Assessed value is not actual value of any asset or product; it is the value which is used for calculation of tax. Assessed value is used to calculate the custom duty and excise duty instead of invoice value. Usually assessed value is the total value of goods includes the cost of products, transportation cost up to the buyer’s location and insurance. There is a separate calculation method to find assessable under Customs Act for import and export of goods. We have written a separate post on ‘how to find assessable value’ in this website. You may click to read same also. What is Invoice value? How does Invoice value play in any type of Business? Invoice value is real value which any buyer has to pay when he buys the goods from any seller. For calculating the invoice price we do all the adjustments relating to discount, VAT and delivery cost. ‘Invoice Value’ includes GST also. So the Invoice value is the actual amount payable to the seller by the buyer after entering in to a business contract. Such business contract decides the responsibility of bearing transportation, insurance, loading and unloading, mode of transport etc. mutually agree between buyer and seller. The above information describes about Invoice value and Assessable value. We hope the above information on the difference between assessable value invoice values helps you. How to export from Papua New Guinea? How to Import to Papua New Guinea? How to import to India from Papua New Guinea? How to export from India to Papua New Guinea? Difference between Pro forma Invoice and Commercial Invoice in Export Import Trade. Do pro-forma invoice accepts for import customs clearance?